On their official blog, Google is announcing that they have rolled out Universal Search to their Suggest functionality for mobile platforms. This feature has been enabled for users on the Google homepage since last December and is now live when you search on your Android Handset as well. Confused about what this does exactly? Say for example, you are on flight Ba 284 from San Fran to London, and wanted to know if the flight was on time as you were going to the airport. 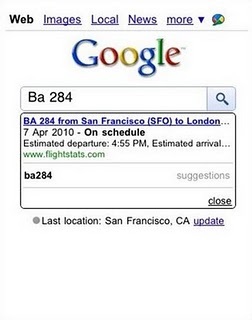 You can simply type in that flight number, and without hitting the search button, Google will give you the information via Suggest. I am always a fan of removing steps from the search process on my handset, and this is precisely what this new feature does. It will be interesting to see how accurate and fast it is going to be as we use it. Check it out on your handset today, the functionality is currently supported on Android-powered devices, iPhones/iPods and Palm WebOS devices in the US. Since 2007 we have offered news and opinion around Android, the mobile space, and connected homes. We aim to help users get more from their smartphones and hope to be a valuable resource for future purchases.